AP PGECET Seat Allotment Results 2018: Andhra Pradesh Post Graduate Common Entrance Test seat allotment results are slated to released on 2nd August. Candidates qualified in the AP PGECET examination and came across with the counseling process from 23rd to 30th July. All the aspirants who had qualified in the GATE/ GPAT/ PGECET can now check the AP APGECET Seat Allotment result and download the allotment order. Students allotted admissions in ME/M. Tech courses in this seat allotment round can download the admission letters and report at the allotted colleges. Aspirants can download the AP PGECET allotment order from the official portal, sche.ap.gov.in/pgecet. Candidates have to pay the requisite admission fee during the reporting time at the allotted colleges. 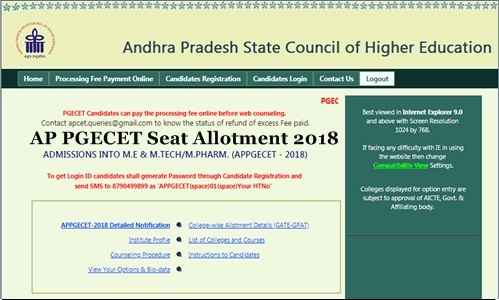 Aspirants can navigate with the following article to check more details about AP PGECET seat allotment order, downloading process, admission dates, and other important details. AP PGECET (Andhra Pradesh Post Graduate Engineering Common Entrance Test) is going to be conducted every year by Andhra University on behalf of AP State Council of Higher Education (APSCHE). A Statutory body of the Govt. AP, Hyderabad. AP PGECET Examination is the entrance examination into various professional post Graduate Courses, M.E, M.Tech, M.Pharmacy, M.Arch in various disciplines of Engineering, Technology, Agriculture, and Pharmacy. The examination was organized from 10th May to 12th May this year. A huge number of hopefuls seeking to get admission in Postgraduate degree courses have competed for the AP PGECET 2018. Andhra University Visakhapatnam has declared the result of AP PGECET on 17th May. Aspirants qualified in the AP APGECET have attended for the counseling process from 23rd July to 30th July for GATE/GPAT/PGECET qualified aspirants. Now, the Andhra University has unveiled the AP PGECET seat allotment result 2018 today, 2nd July. Aspirants can check the AP PGECET seat allotment list from the SCHE AP official portal. Qualified aspirants who listed to get admission in ME/M.Tech courses in the state of Andhra Pradesh can download the admission letter from today. Aspirants have to report at the allotted colleges along with the admission letter as per the scheduled dates. Candidates can check the dates to report at the allotted college, admission fee and other details from the SCHE AP official portal, sche.ap.gov.in/pgecet. Candidates can follow the below-given process to download the seat allotment order. Steps to download AP PGECET Seat Allotment Results 2018? On the Homepage, search for the AP PGECET Allotment Order 2018 Link. Provide the details of ICR Code, Hall Ticket Number, Date of Birth etc. Take a printout of the allotment order for future use. 1.2 Steps to download AP PGECET Seat Allotment Results 2018? Hello. Sir when we will. Get allotment order for pgcet (mtech) admission. Third counseling conducted or not??? Hai sir good..Could you please tell me when is Second phase counselling take place and do is there any possibility to attend for certificate verification in second counselling as I failed to attend it in first phase..